Science Online started Wednesday and hundreds of incredibly talented science writers descended on my city for it. This is my first year at Science Online and I’m having a blast! I’ve gotten to meet a few of my science writing heroes, talked about citizen science with a lot of people, and have learned all sorts of new things in the sessions. There are several bug bloggers here (more about that shortly) and all five of my photo submissions made it into the SciArt show. Super fun! Then there is the swag… Oh, the swag! I wish all conferences gave you science books! That’s a whole lot better, at least to me, than all the water bottles I never use and bags that I end up giving away because I have too many. Free science books are always welcome! 1. 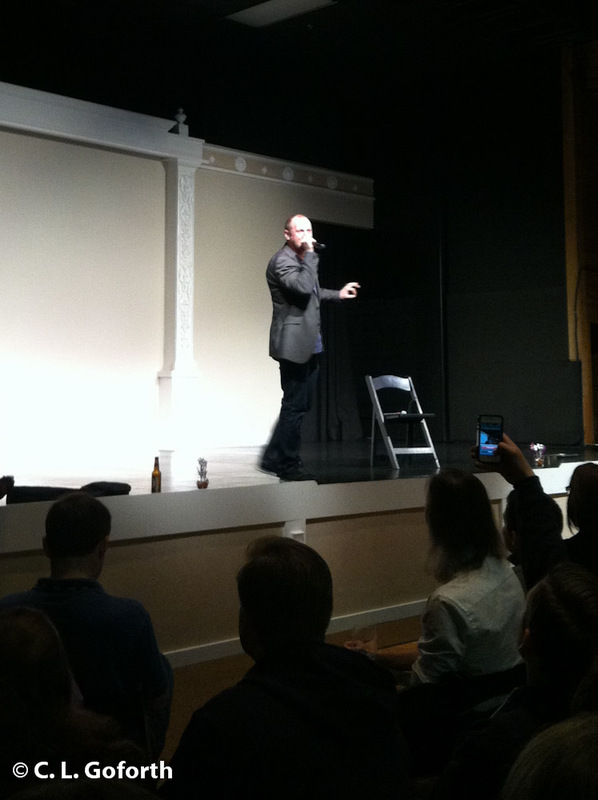 Science raps done by a white guy with a degree in medieval literature are darned funny! 2. Using personal narrative in science writing can be a great way to bring people into the story and make them appreciate science. 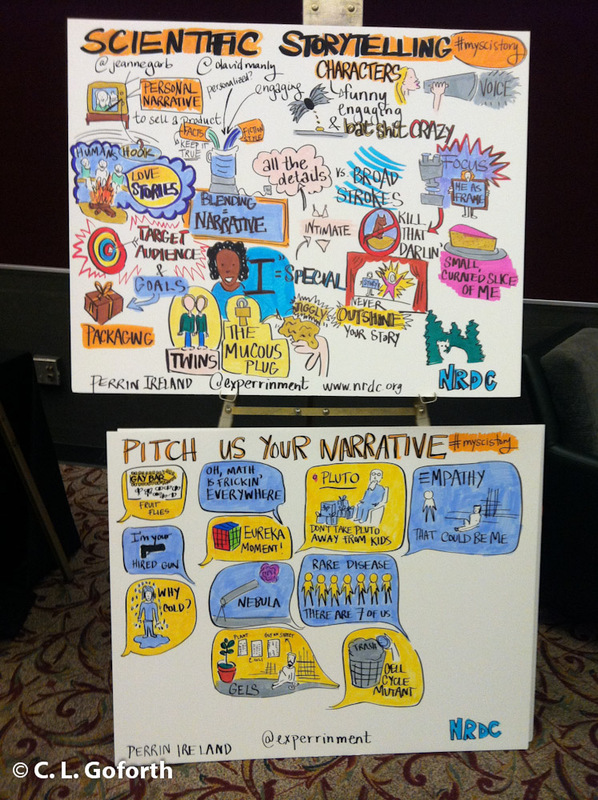 The doodle from the personal narrative session highlighting some of the stories and points made – click to expand! I went to a session on the role of personal narrative in science writing and I loved it! Partly I was excited because I was sitting two seat back from Carl Zimmer, only a few seats away from Ed Yong, and Alex Wild was directly in my line of sight, but it was great to hear so many well-respected, amazingly skilled science writers talk about how they have used personal stories to draw people into the science and see the relevance of the science to their own lives. I think I enjoyed this session partly because I like to tell these kinds of stories already, though I have a new idea about how to write them that I’m going to try. Having so many very well-respected science writers validate a writing style that I love to use, however, made it seem so much more legitimate. 3. The ethics surrounding citizen science are Much more complicated than I would have expected – and it is something that all citizen science project leaders should think about. 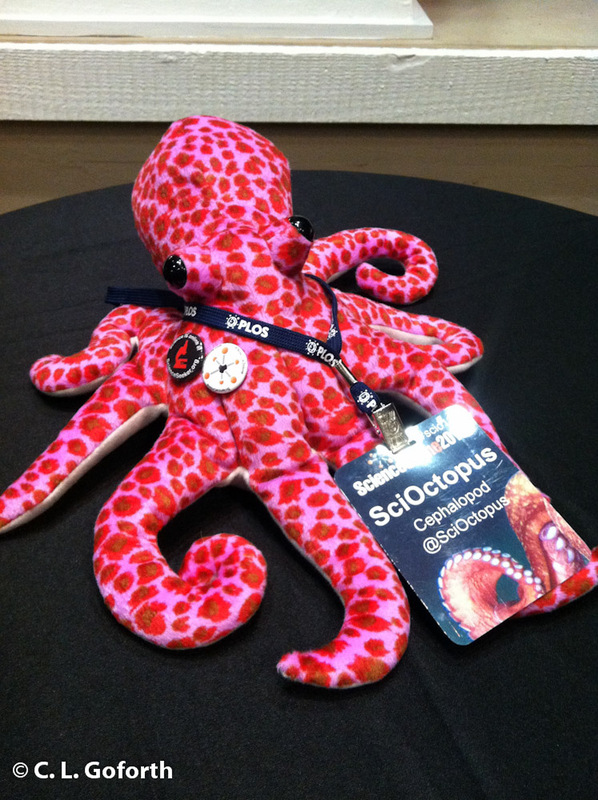 This has nothing to do with ethics, but this little guy is the official mascot of Scio13 – SciOctopus! I am very aware of privacy issues related to my Dragonfly Swarm Project and all personal data that I collect is seen by me and no one else, and never will be shared with others. That said, we discussed several things that I hadn’t ever even thought about in the session about ethics in citizen science. For example, if you have people sign consent forms, they often don’t read them, yet sign them. (Guilty!) There are tricks you can employ to force people to read the forms, such as giving a test based on what they read, but I hadn’t ever really considered that you might need to do that. A lot of what we talked about in the session were related to studies that involve human subjects (such as the face mite project I participated in on Wednesday – had my face scraped with a little metal spatula to try to find mites in my pores for the newest and upcoming Your Wild Life project), but I came away with a lot of new things to think about. I love blogging and hope I will be able to do it for a long time. But, every now and then you just don’t feel like writing, life gets in the way, or you can’t find the time. I attended a session on blogging for the long haul yesterday that offered a lot of great tips. These included carving out special time for blogging, blogging according to a schedule (I do this! ), keeping lists of ideas when they come to you and writing about your favorite, and making the most of super productive times when you write a ton of posts by spreading them out over several weeks or months so that they give you a buffer against writer’s block. 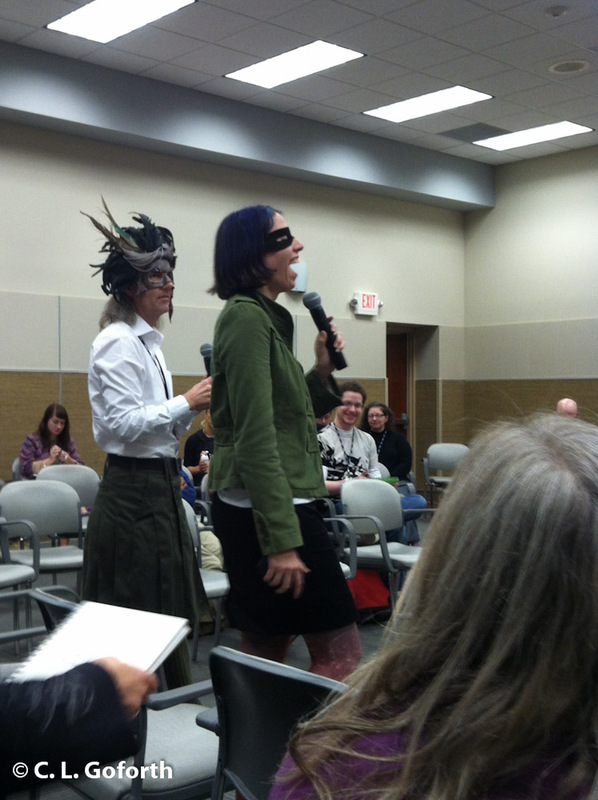 I thought this session was incredibly helpful, and the Scio13 organizers recorded it. I don’t know if/when/where it will go up online, but I’ll post the link if it goes online. A lot of people could benefit from it. I took copious notes too, so let me know if you want to hear any more of the tips shared! 5. Bug bloggers are an incredibly fun group of people! There are a lot of familiar faces at Scio13, especially bug bloggers that I have either met in person (largely via Bug Shot) or have been following online. We got together for dinner tonight and it might be the highlight of the conference for me. There’s something about sitting down with a group of people who all have the same eclectic interest as you, who get all the seriously nerdy jokes you tell, and who understand why you do the kinds of things that you do, that is just indescribable. 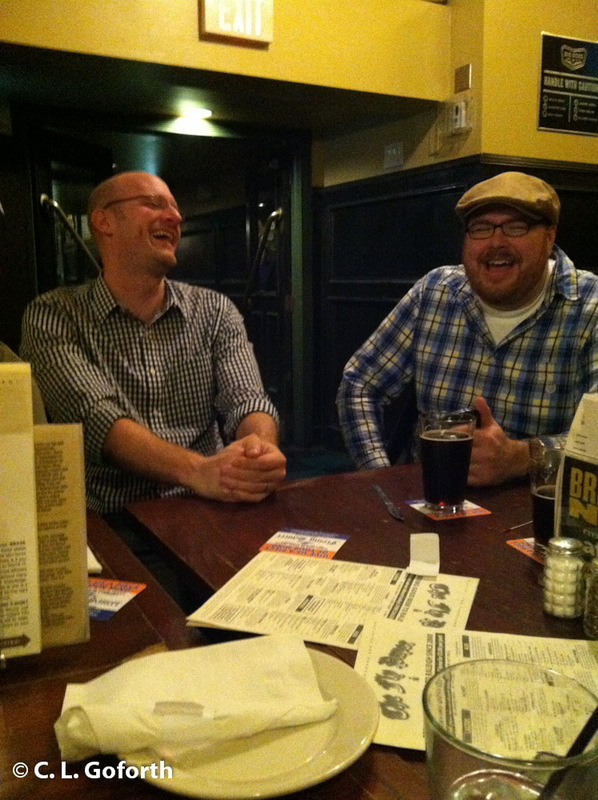 We had to scream across the table to be heard at the noisy bar, but we laughed so hard my stomach muscles still ache. Cheers especially to Alex Wild, Bug Girl, Morgan Jackson, Maryanne Alleyne, Matt Bertone, and Holly Menninger for the great evening! It’s hard to summarize all the things I’ve learned and discovered at this conference in five bullet points, but this is a taste of what I’ve been doing for the last few days. I’m having a great time, but I’m learning so much at the same time. What a great experience! I’m so happy I am a part of it this year. Every time I get on Twitter this week I’m green with envy. Glad you’re having so much fun! And please do post the link to the video of the “blogging for the long haul” session when it goes up – I know I’ll forget to look for it. I daydream that I’ll make it to Science Online one of these years, but since my blog isn’t really much of a science blog, I might be pretty out of place. We’ll see. I feel a little gloaty every time I tweet something, I have to admit. And even if your blog isn’t strictly a science blog, it couldn’t hurt to come. There are a lot of really great ideas for engaging your audience, building a community, and keeping your blog going over long periods of time, so I’m sure you’d get something out of it. That said, it’s expensive to fly to Raleigh, stay in a hotel 4 nights, and pay for registration. I could never justify it before I moved here because it was a lot of money to spend on something that was just a personal blog. Now I not only live in town, but I also have a work-based reason to be there, so I felt like I finally had a reason to go. I’m happy I did! I think the blogging for the long haul should be placed online eventually as it is part of the watch party sessions where people who are signed up to watch remotely can see them. That means it should be made available, but we’ll see. I’ll send you my notes if it doesn’t go online! Have fun down there! Please do link to that session, for exactly the same reason Rebecca mentioned…I think I will need it sometime! I will definitely link to the blogging for the long haul session if/when they put it online. If not, I’d be happy to send my notes your way! Or maybe I’ll just write a blog post about it… That might be most efficient. I’m sad that I couldn’t be there – sounds like my kind of crowd. I’m definitely into blogging for the long haul and would love to see your notes and see what tricks others who have been doing it awhile might have. I think you would love it Ted! And I will send my notes your way soon, though I’m considering writing a blog post about it. I think a lot of people might want to hear about it. It looks so funny these kind of meetings. Pitty here in Portugal doesn’t happen nothing like that. No? You must have some SOMEWHERE! If not, you must come to the US and go to one. They’re quite fun! I would love to go to USA and be at on. Specially with bugs bloggers! That’s probably the best compliment I could ever get, so thanks! Do you blog in English? If so, send me a link! I’d love to read what you write. Pingback: The many feathers in all my caps. | Insects Did It First. Can Engineers Do It Better? This is such a great blog! I am writing a book with a dragonfly main character (beastlyvirtues.blogspot.ca) and I keep find my way back here whenever a question pops into my head! Awww, thanks. I’m glad you like what I have to offer!